Paris Metro, as the name suggests, was inspired directly by the work of architect Hector Guimard. During the late 1800's to early 1900's, he designed stunning work in the Art Nouveau style. His designs for the Paris Metro stations especially were some of the best examples from the period. This is a large piece, consisting of two matched modules, each totalling about seven feet long. Each side module is made up of two separate panels, these each three and a half feet wide and about six and half tall. The sides are linked by a series of overhead arches, raising up to about eight feet at the peek and spanning a distance of about five feet between the upright panels. Two panels of the arbour were set up as an area divider at Styll at 5 Mill Street until the building was sold, Winter of 2018. The remaining two panels have long been installed along a front deck, to one side of the entrance to the Wareham Forge. I designed and created 'Paris Metro' specifically for the garden presentation by Adam Gracey at Canada Blooms - Spring 2008. This highly forged piece was intended to act as wall mounted arbour to support roses or other flowering plants. It features the use of the 'feather' technique - aggressively forged angle into the central plant shapes. The base colour is a dark brown, with decorative paint in white and yellow highlighting the leaves. The total height of this piece is about 1.65 m (5 ft 6 inches). After transporting and exhibiting at a number of major shows, the original painted surface was in need of renewing. In 2015 I re-painted it using a dark green colour overall, with a more subtle use of a lighter green along the main uprights and flash of copper inside the 'feathers'. Price includes: Delivery within Southern Ontario, 30 minutes installation time. Yates House is located in Mono Centre. It is a charming early 1800's clapboard, with a lot of the original wood trim and character lovingly restored. The owner maintains a medical practice from home, and wanted the new window boxes to fit in with the existing sign hanger and both a Celtic feel and the overall look of the house. 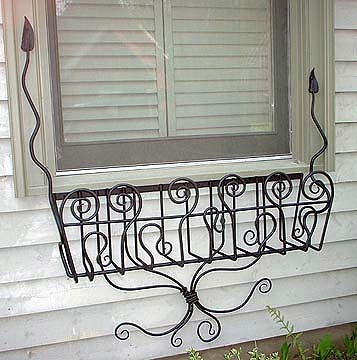 The two large window box frames (shown just after installation) use sweeping spirals and tendrils that run up the window frames. 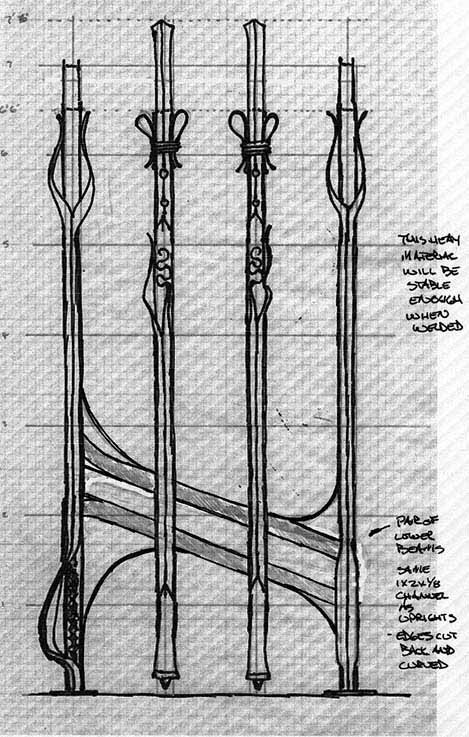 See the original layout and one alternate design for the project. Garden Borders (Summer 2002) Was a set of related pieces based on a single concept. Imagine a decorative border 'fence', where the emphasis of the art work was on the individual uprights. 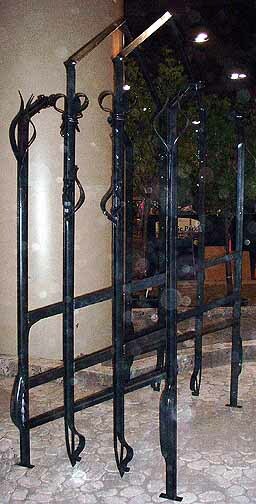 Each 'post' would be linked with simple straight rods, allowing for more elaborate forgings and designs, and stands about three feet high. I created three different prototypes. The link sections span about four feet, keeping the total cost down. The posts could be used individually, as a single design repeated, or even as a series of different patterns. The second, 'Starlight' uses square tube as the core. To this has been added leaves and tendrils. Decorative paint in shades of blue emphasizes the contours. The whole is topped with a solar powered lamp. The last prototype, 'Sun Disk', features a heavy glass disk set into a frame of forged channel stock. In the end, each of these pieces, although intended to be samples of a possible longer boundary chain, were purchased to serve as single stand alone features within the garden setting. 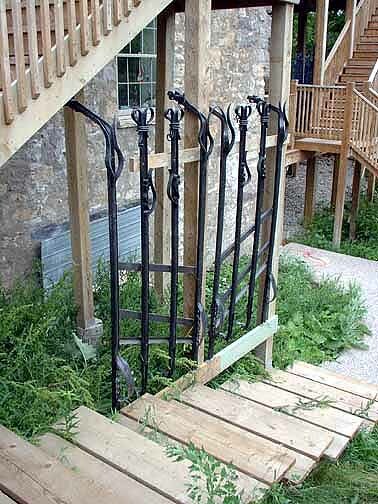 'Lilly Arbour' (Spring 2000) is another piece based on the techniques and rough concept seen on the 'Lilly Gate' (seen with Garden Gates). 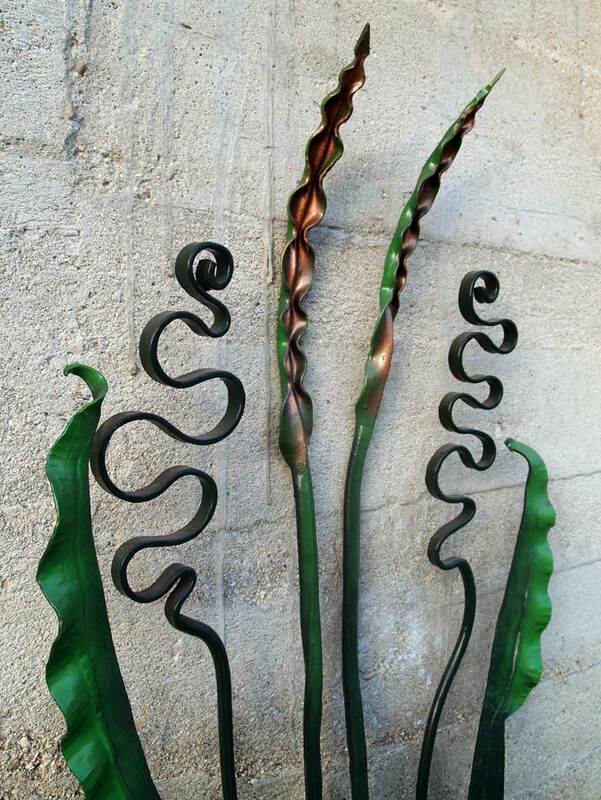 Here a similar form of tubes with spread and formed lily shapes is combined to make a wall arbour or trellis. The completed work is about two feet wide and about five high. I also continued to experiment with simple decorative paint, here colouring in interior of the lilies white , deepening to a red - orange. This piece was constructed as a prototype / display piece for my presentation at the Toronto International Home and Garden Show. It now is installed as a dramatic entrance feature at a private home in Niagara-on-the-Lake. 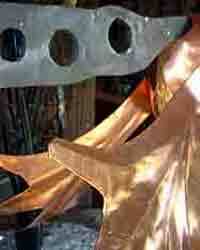 All text & photographs © the Wareham Forge.